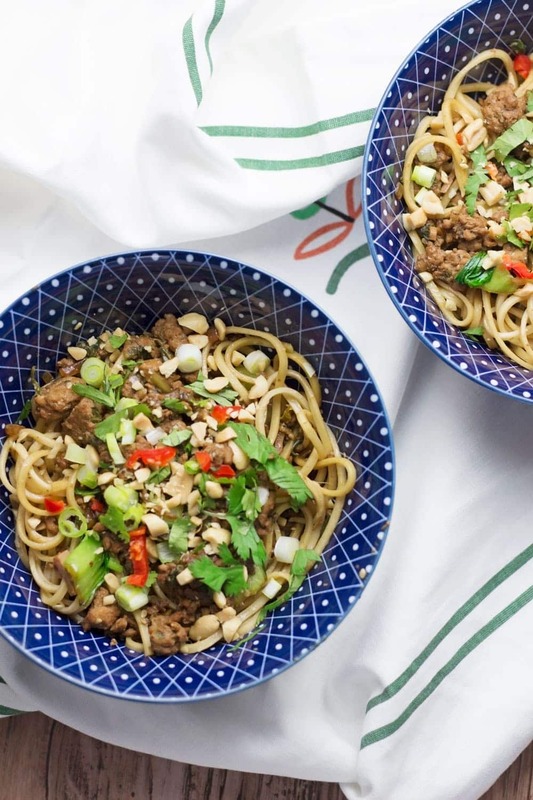 These spicy pork mince noodles are your next easy weeknight recipe! 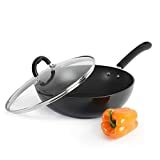 Have dinner on the table in less than half an hour and serve a meal with a kick. They really are the perfect use for minced pork. We really like having pork mince on hand for quick and easy dinners. 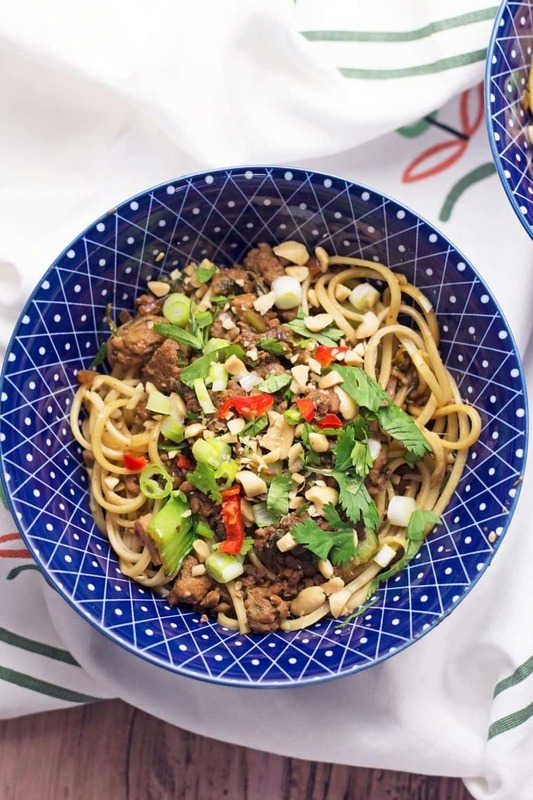 It cooks quickly and has great flavour, it also goes amazingly with loads of difference cuisines bus Asian is one of our favourite ways to use it. 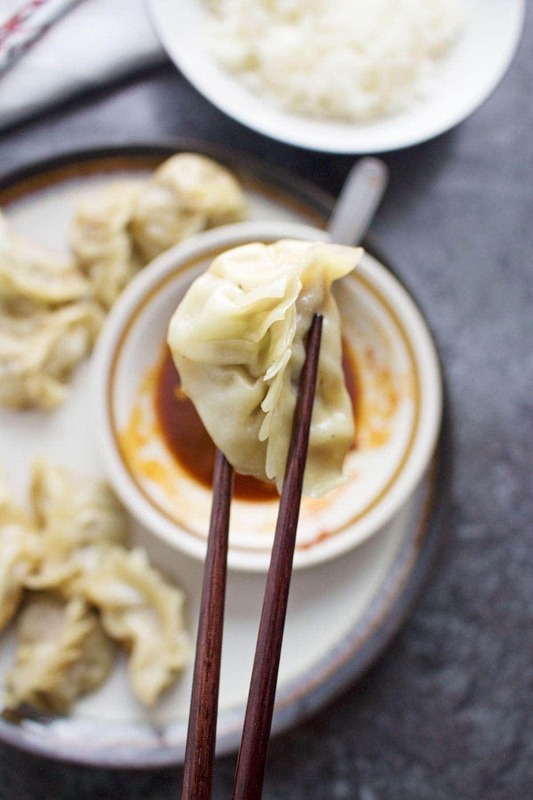 If you’re looking for more pork mince recipes this pork and courgette ramen or easy pork potstickers are some of my favourites on the blog so check those out too after you’ve read this post! We’ve just got back from holiday. We were in Dubrovnik, Croatia for a few days and we had such a good time just relaxing. We had one beautiful sunny day and two rainy days. On the sunny day we took a walk around the city walls and I managed to get a slightly burned forehead and nose. Then on the rainy days we went and sat in bars and drank wine and baileys hot chocolates and, not gonna lie, I think they were probably better than the days we actually did stuff. I’ve been so excited to get away for a while and getting some quality time with Will just soothed me a bit after being pretty stressed recently. Alas now it’s nearly back to real life but luckily we have once more day off tomorrow since it’s a bank holiday here in the UK. We’re having some friends round for lunch and I’m just going to try and pretend work doesn’t exist for one more day! This recipe is exactly what I’m going to need next week when I’m back in the office and not getting home til 7pm each night. It’s so super quick and tasty. All you need to do is mix your pork mince with a load of other yummy ingredients like pak choi, bamboo shoots and soy sauce then fry it off in a little sesame oil and mix with freshly cooked noodles. I don’t know about you but I tend to have most of those ingredients on hand. If you like to cook Asian food then I’d recommend you stock up on a couple of these bottles and jars and then you’ll be able to whip up some spicy pork mince noodles (or any other Asian inspired recipe you fancy) in a matter of minutes, no shopping required! And of course don’t forget the toppings. Chopped peanuts, chilli and coriander (cilantro) are all vital in this situation to make a perfect combination of flavours and textures. 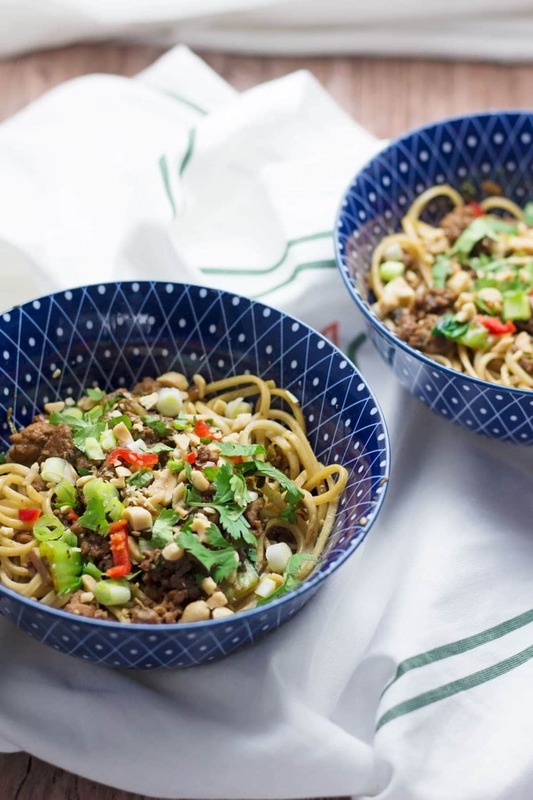 WONDERING WHAT TO DO WITH THE LEFTOVER INGREDIENTS YOU’VE GOT FROM MAKING THESE QUICK & EASY SPICY PORK MINCE NOODLES? 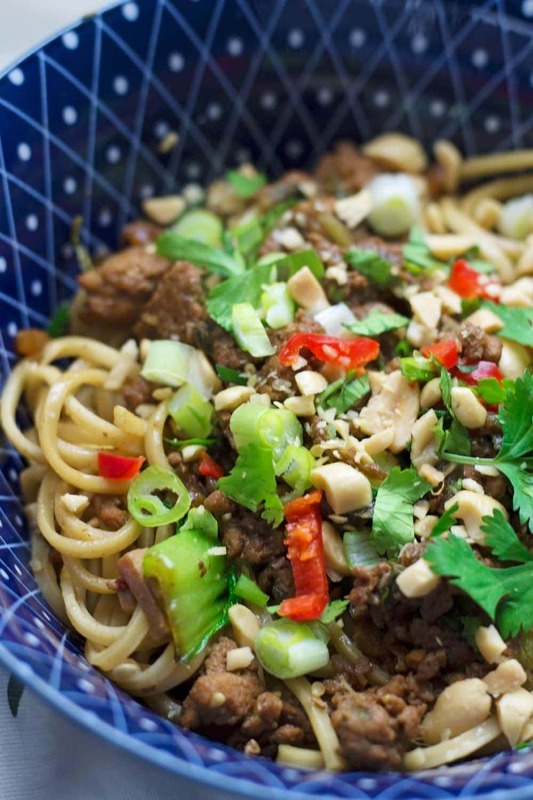 Mix everything except the noodles and the sesame oil together in a bowl and set aside. Heat the sesame oil in a wok over a medium-high heat. Add the pork mixture and cook until the pork is browned and starting to crisp. Tip in the noodles and stir until everything is combined. Remove from the heat and split between four bowls. 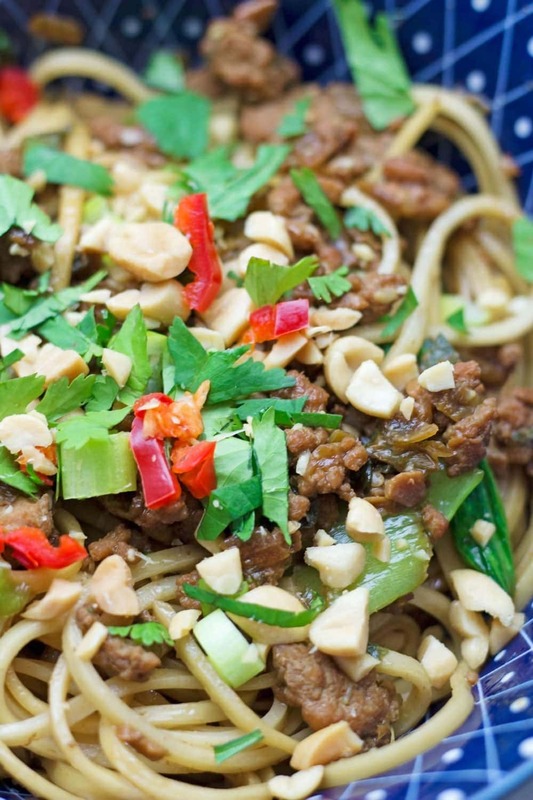 Top with the chopped chilli, coriander and peanuts. These look lovely. I was just trying to find a recipe like this for dinner last night – these look better than the dish I finally settled on. Was Croatia good? I’m thinking of going next yea. Croatia was lovely, I’d definitely recommend it! Wish I had this for lunch today! 🙂 I’ve been to several places in Croatia and every single one was beautiful! It’s a great country to visit! Looks so flavorful, stir fry recipes are so easy and versatile, love it! These really do look super easy. 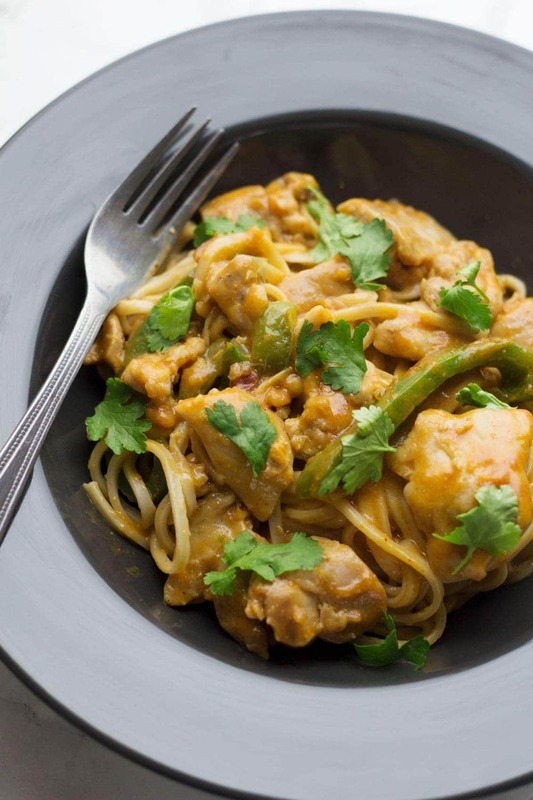 The perfect quick weeknight meal that has lots of flavour. This looks like a hearty, flavorful dish — I know my husband would love this for dinner with a glass of wine! Lovely! Fantastic! Home cooked minced meat noodles with more chilli.